Diabetic nephropathy (DN) is the leading cause of end-stage renal disease in diabetics worldwide, yet most patients with type-2 diabetes mellitus are not formally evaluated with a renal biopsy. The diagnosis is almost always based on clinical grounds. A wide spectrum of non-diabetic renal disease (NDRD) is reported to occur in patients with type-2 diabetes. It has been estimated that up to one-third of all diabetic patients who present with proteinuria are suffering from NDRD. The aim of this analysis was to evaluate the prevalence and etiology of NDRD in patients with type-2 diabetes. We retrospectively reviewed the medical records of patients with type-2 diabetes who underwent kidney biopsy on clinical suspicion of NDRD (absence of diabetic retinopathy and/or neuropathy; short duration of diabetes, i.e. less than five years) from January 2003 through December 2007 at the Aga Khan University Hospital, Karachi. Based on the biopsy findings, patients were grouped as Group-I, isolated NDRD; Group-II, NDRD with underlying DN; and Group-III, isolated DN. Of 68 patients studied, 75% were males and the mean age was 56 years. The mean duration of diabetes was nine years. Group-I included 34 patients (52%), Group-II included 11 patients (17%) and Group-III included 23 patients (31%). Among the Group-I patients, the mean age was 56 years (41-77 years). The most common NDRDs were acute interstitial nephritis (32%), diffuse proliferative glomerulonephritis (17%); membranous nephropathy (12%) and crescentic glomerulonephritis (12%). Among Group-II, the mean age was 60 years (46-71 years), and the most common lesion was interstitial nephritis superimposed on underlying DN (63% cases). Among Group-III, the mean age was 53 years (42- 80 years). The mean proteinuria was 5, 6.3 and 7.3 g/24 h of urine collection in Groups I, II and III, respectively (P = NS). The mean duration of diabetes was 7.3, 11.7 and 10.7 years in Groups I, II and III, respectively. The duration of diabetes was significantly less in Group-I compared with Group-II and Group-III (P = 0.04). Our study suggests that the prevalence of NDRD (either isolated or superimposed on underlying DN) is high in appropriate clinical settings. Performing renal biopsy in diabetics with no extrarenal end organ damage other than nephropathy helps to diagnose and treat NDRD. This is the first report from Pakistan documenting the prevalence of NDRD in patients with type-2 diabetes. But, this story is not simple because all renal diseases that occur in diabetic patients need not always be DN. It has been estimated that up to one-third of diabetic patients who present with proteinuria are suffering from non-diabetic renal diseases (NDRD). ,,,, The usual criteria for suspecting NDRD and performing kidney biopsy in patients with type-1 diabetes are presence of microscopic hematuria, absence of diabetic retinopathy, uncharacteristic change in kidney function or presence of other systemic diseases. However, the validity of these clinical conditions is not well established for patients with type-2 diabetes. The occurrence of isolated NDRD or with concurrent DN has important implications for therapy and prognosis as DN is hard to reverse, but some NDRD are often treatable and even remittable. The prevalence of NDRD in patients with type-2 diabetes has been variably reported in the published literature. Studies from India have reported the prevalence of NDRD to vary from 12% to 72.5%. The prevalence and nature of NDRD in patients with type-2 diabetes is not documented in Pakistan. The aim of this study is to assess the prevalence and to study the etiology of NDRD and correlate it with clinical parameters such as duration of diabetes, amount of proteinuria and microscopic hematuria at a tertiary care hospital in Pakistan. We retrospectively reviewed the medical records of patients who underwent kidney biopsy from January 2003 through December 2007 at our institute, The Aga Khan University Hospital. Of 273 patients who had undergone renal biopsy, 68 had type-2 diabetes and were biopsied on clinical suspicion of NDRD. Sudden onset of nephrotic range proteinuria with normal kidney function. Patients with ESRD were excluded. The biopsy material was processed for light microscopy and immunofluorescence. DN was diagnosed by an experienced renal pathologist by the presence of mesangial expansion and diffuse inter-capillary glomerulosclerosis, with or without the nodular Kimmelstiel-Wilson formation, basement membrane thickening, fibrin caps or capsular drops. Clinical details including age, gender, duration of diabetes, presence or absence of hypertension, presence or absence of diabetic retinopathy and indication for biopsy were recorded from the case records. The laboratory profile noted included blood urea nitrogen (BUN), serum creatinine, urinalysis and degree of proteinuria either by 24-h urine collection or by spot urine protein to creatinine ratio. The duration of diabetes was defined as the period between the age at onset and age at performing renal biopsy. Hypertension was defined as blood pressure more than 140/90 mmHg with or without antihypertensives. Diabetic retinopathy was diagnosed on fundoscopy by an ophthalmologist; diagnostic findings included presence of background retinopathy (microaneurysms, hemorrhages, soft exudates, hard exudates) with or without proliferative changes. Correlation of histological findings with clinical and biochemical parameters was carried out. Collected data were analyzed using SPSS for windows version 15. Data are expressed as mean ± SD. Differences between groups were assessed by using the univariate chi-square test for categorical variables, unpaired t-test or ANOVA for continuous variables where appropriate; P <0.05 was considered statistically significant. A total of 68 patients with type-2 diabetes underwent renal biopsy during the study period. 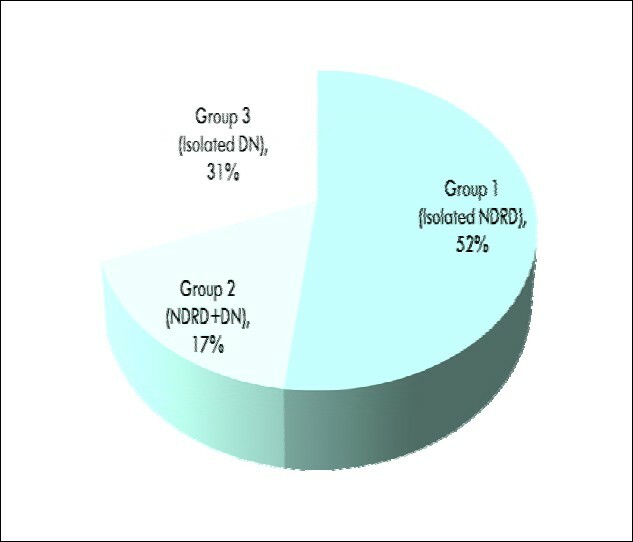 Thirty-four patients (52%) belonged to Group-I (isolated NDRD), 11 (17%) to Group-II (NDRD with underlying DN) and 23 (31%) to Group-III (isolated DN) [Figure 1]. Clinical and laboratory parameters in the three groups are shown in [Table 1]. Males outnumbered females in all the groups. The duration of diabetes was significantly less in Group-I than in Group-II and Group-III (P = 0.04). The prevalence of hypertension was similar in all three groups. Level of proteinuria was higher in Group-II and Group-III when compared with Group-I, but the difference was not statistically significant. The serum creatinine levels were significantly higher in Group-II and Group-III (P <0.0001). The incidence of microscopic hematuria was not different among the three groups. Figure 1: Group frequencies among the study patients. Table 1: Clinical and laboratory parameters in the different groups of patients studied. Indications for renal biopsy included rapidly declining renal function in 31 patients (45.5%), absence of diabetic retinopathy in 12 patients (17.6%), unexplained acute kidney injury in 12 patients (17.6%) and duration of diabetes mellitus less than five years in nine patients (13.2%), and miscellaneous in eight others [Table 2]. Table 2: Indications for kidney biopsy in the study patients. The histological lesions identified in patients in Group-I and Group-II are presented in [Table 3]. Among Group-I patients, the most common NDRD were acute interstitial nephritis (AIN) (32%), diffuse proliferative glomerulonephritis (20.5%); membranous nephropathy (12%) and crescentic glomerulonephritis (12%), while Group-II predominantly comprised AIN (63%). Table 3: Histological diagnosis in patients in Group-I and Group-II. Among patients with type-2 diabetes who had renal biopsy, the prevalence of NDRD varies widely in the published literature, from 12% to 79%, depending on the selection criteria and the population being studied. ,,,,,,,,,,,,,,, In our study, all patients had type-2 diabetes, and 69% of the patients had NDRD (either isolated or superimposed on underlying DN). The pathogenesis of NDRD in patients with diabetes is not well understood. Whether there are common etiologic factors in relation to diabetes or it is merely a coincidence is not clear. Some authors have suggested that the predisposition of DN to superimposed nephritis could be attributed to enhanced exposure of antigenic cellular components, triggering immune responses. Others, however, found no difference in the prevalence of NDRD between patients with and without diabetes and that the co-existence of a different glomerulonephritis in the diabetic kidney may be merely coincidental. ,, The renal outcome in diabetic patients with NDRD varies and depends on the specific type of non-diabetic renal lesion. We conclude that the prevalence of NDRD, either isolated or superimposed on underlying DN, is high in diabetics with proteinuria. It is recommended that nephrologists maintain a high index of suspicion for performing renal biopsy in diabetic patients. Early diagnosis of NDRD helps in instituting appropriate therapy, which in turn could aid in prolonging renal survival in this patient population. 1. Zhou J, Chen X, Xie Y, Li J, Yamanaka N, Tong X. A differential diagnostic model of diabetic nephropathy and non-diabetic renal diseases. Nephrol Dial Transplant 2008;23: 1940-5. 2. Wild S, Roglic G, Green A, Sicree R, King H. Global prevalence of diabetes: estimates for the year 2000 and projections for 2030. Diabetes Care 2004;27:1047-53. 3. Boyle JP, Honeycutt AA, Narayan KM, et al. Projection of diabetes burden through 2050: Impact of changing demography and disease prevalence in the U.S. Diabetes Care 2001; 24:1936-40. 4. Colagiuri S, Borch-Johnsen K, Glumer C, Vistisen D. There really is an epidemic of type 2 diabetes. Diabetologia 2005;48:1459-63. 5. US Renal Data Systems. USRDS 2004 Annual Data Report: Atlas of End-Stage Renal Disease in the United States. Bethesda, MD: National Institutes of Health, National Institute of Diabetes and Digestive and Kidney Diseases; 2005. 6. Gross JL, de Azevedo MJ, Silveiro SP, Canani LH, Caramori ML, Zelmanovitz T. Diabetic nephropathy: diagnosis, prevention, and treatment. Diabetes Care 2005;28:164-76. 7. US Renal Data Systems. USRDS 2006 Annual Data Report: Atlas of End-Stage Renal Disease in the United States. Bethesda, MD: National Institutes of Health, National Institute of Diabetes and Digestive and Kidney Diseases; 2007. 8. Coresh J, Astor BC, Greene T, Eknoyan G, Levey AS. Prevalence of chronic kidney disease and decreased kidney function in the adult US population: Third National Health and Nutrition Examination Survey. Am J Kidney Dis 2003;41:1-12. 9. Middleton RJ, Foley RN, Hegarty J, et al. The unrecognized prevalence of chronic kidney disease in diabetes. Nephrol Dial Transplant 2006;21:88-92. 10. Gambara V, Mecca G, Remuzzi G, Bertani T. Heterogeneous nature of renal lesions in type II diabetes. J Am Soc Nephrol 1993;3:1458-66. 11. Lai FM, Li PK, Pang SW, et al. Diabetic patients with IgA nephropathy and diabetic glomerulosclerosis. Mod Pathol 19936:684-90. 12. Ruggenenti P, Gambara V, Perna A, Bertani T, Remuzzi G. The nephropathy of non-insulin-dependent diabetes: Predictors of outcome relative to diverse patterns of renal injury. J Am Soc Nephrol 1998;9:2336-43. 13. Suzuki Y, Ueno M, Hayashi H, et al. A light microscopic study of glomerulosclerosis in Japanese patients with noninsulin-dependent diabetes mellitus: the relationship between clinical and histological features. Clin Nephrol 1994;42:155-62. 14. Wong TY, Choi PC, Szeto CC, et al. Renal outcome in type 2 diabetic patients with or without coexisting nondiabetic nephropathies. Diabetes Care 2002;25:900-5. 15. Serra A, Romero R, Bayes B, Lopez D, Bonet J. Is there a need for changes in renal biopsy criteria in proteinuria in type 2 diabetes? Diabetes Res Clin Pract 2002;58:149-53. 16. Soni SS, Gowrishankar S, Kishan AG, Raman A. Non diabetic renal disease in type 2 diabetes mellitus. Nephrology (Carlton) 2006;11:533-7. 17. Kramer H, Molitch ME. Screening for kidney disease in adults with diabetes. Diabetes Care 2005;28:1813-6. 18. Andersen AR, Christiansen JS, Andersen JK, Kreiner S, Deckert T. Diabetic nephropathy in Type 1 (insulin-dependent) diabetes: An epidemiological study. Diabetologia 1983;25: 496-501. 19. Mauer SM, Chavers BM, Steffes MW. Should there be an expanded role for kidney biopsy in the management of patients with type I diabetes? Am J Kidney Dis 1990;16:96-100. 20. Mogensen CE, Christensen CK. Predicting diabetic nephropathy in insulin-dependent patients. N Engl J Med 1984;311:89-93. 21. John GT, Date A, Korula A, Jeyaseelan L, Shastry JC, Jacob CK. Nondiabetic renal disease in noninsulin-dependent diabetics in a south Indian Hospital. Nephron 1994;67:441-3. 22. Kramer HJ, Nguyen QD, Curhan G, Hsu CY. Renal insufficiency in the absence of albuminuria and retinopathy among adults with type 2 diabetes mellitus. JAMA 2003;289: 3273-7. 23. Lee EY, Chung CH, Choi SO. Non-diabetic renal disease in patients with non-insulin dependent diabetes mellitus. Yonsei Med J 1999;40:321-6. 24. Mak SK, Gwi E, Chan KW, et al. Clinical predictors of non-diabetic renal disease in patients with non-insulin dependent diabetes mellitus. Nephrol Dial Transplant 1997;12: 2588-91. 25. Nzerue CM, Hewan-Lowe K, Harvey P, Mohammed D, Furlong B, Oster R. Prevalence of non-diabetic renal disease among African-American patients with type II diabetes mellitus. Scand J Urol Nephrol 2000;34:331-5. 26. Pham TT, Sim JJ, Kujubu DA, Liu IL, Kumar VA. Prevalence of nondiabetic renal disease in diabetic patients. Am J Nephrol 2007;27:322-8. 27. Richards NT, Greaves I, Lee SJ, Howie AJ, Adu D, Michael J. Increased prevalence of renal biopsy findings other than diabetic glomerulopathy in type II diabetes mellitus. Nephrol Dial Transplant 1992;7:397-9. 28. Tone A, Shikata K, Matsuda M, et al. Clinical features of non-diabetic renal diseases in patients with type 2 diabetes. Diabetes Res Clin Pract 2005;69:237-42. 29. Amoah E, Glickman JL, Malchoff CD, Sturgill BC, Kaiser DL, Bolton WK. Clinical identification of nondiabetic renal disease in diabetic patients with type I and type II disease presenting with renal dysfunction. Am J Nephrol 1988;8:204-11. 30. Glassock RJ, Hirschman GH, Striker GE. Workshop on the use of renal biopsy in research on diabetic nephropathy: A summary report. Am J Kidney Dis 1991;18:589-92. 31. Parving HH, Gall MA, Skott P, et al. Prevalence and causes of albuminuria in non-insulin-dependent diabetic patients. Kidney Int 1992;41:758-62. 32. Lin YL, Peng SJ, Ferng SH, Tzen CY, Yang CS. Clinical indicators which necessitate renal biopsy in type 2 diabetes mellitus patients with renal disease. Int J Clin Pract 2009;63:1167-76. 33. Mazzucco G, Bertani T, Fortunato M, et al. Different patterns of renal damage in type 2 diabetes mellitus: A multicentric study on 393 biopsies. Am J Kidney Dis 2002;39:713-20. 34. Prakash J, Sen D, Usha, Kumar NS. Non-diabetic renal disease in patients with type 2 diabetes mellitus. J Assoc Physicians India 2001;49:415-20. 35. Huang F, Yang Q, Chen L, Tang S, Liu W, Yu X. Renal pathological change in patients with type 2 diabetes is not always diabetic nephropathy: A report of 52 cases. Clin Nephrol 2007;67:293-7. 36. Bertani T, Mecca G, Sacchi G, Remuzzi G. Superimposed nephritis: A separate entity among glomerular diseases? Am J Kidney Dis 1986;7:205-12. 37. Matias P, Viana H, Carvalho F, Santos JR. Diabetes mellitus and renal disease: when to perform a renal biopsy? Port J Nephrol Hypert 2009;23:167-73. 38. Taft JL, Billson VR, Nankervis A, Kincaid-Smith P, Martin FI. A clinical-histological study of individuals with diabetes mellitus and proteinuria. Diabet Med 1990;7:215-21. 39. Moger V, Kumar SK, Sakhuja V, et al. Rapidly progressive renal failure in type 2 diabetes in the tropical environment: A clinico-pathological study. Ren Fail 2005;27:595-600. 40. Orfila C, Lepert JC, Modesto A, Pipy B, Suc JM. IgA nephropathy complicating diabetic glomerulosclerosis. Nephron 1998;79:279-87. 41. Bohle A, Wehrmann M, Bogenschutz O, Batz C, Muller CA, Muller GA. The pathogenesis of chronic renal failure in diabetic nephropathy. Investigation of 488 cases of diabetic glomerulosclerosis. Pathol Res Pract 1991;187:251-9. 42. Waldherr R, Ilkenhans C, Ritz E. How frequent is glomerulonephritis in diabetes mellitus type II? Clin Nephrol 1992;37:271-3. Zhuo, L. and Zou, G. and Li, W. and Lu, J. and Ren, W.